First, I have to say that I didn’t grow up in a church that celebrated Lent. The Lenten season is something I have only in the last five years begun to both participate in and begin to incorporate in youth ministry. I’m no expert. But here is what I have come to realize about the ancient season leading up to Easter: we all need resurrection. I appreciate Lent because it provides a space for us as youth workers and for our students to see our need for resurrection and find hope that Jesus can actually give it to us. There is something about the first warm day of spring after a long winter. Even if you live in a warm climate year-round, you get what I’m talking about—the first day of school, getting your Christmas decorations out of storage, packing up the family and heading to the pumpkin patch. Humans love holidays and seasons. They are a natural break in the monotony of life. They reinvigorate our passion and our hope. We can harness this anticipation of something new by participating in Lent with our students. It takes a spark to start a fire. This could be the spark that is a catalyst for growth in your students—whether Lent has always been sacred in your youth ministry, or if you’ve never incorporated it at all. You already know this. Teenagers are anxious and depressed. Often times we, the youth workers, aren’t much better. We are legitimately addicted to screens which greatly hinders our relationships, leads to other addictions, and keeps us from getting adequate sunlight, exercise, and eating healthy. We don’t just watch our show once a week anymore, we binge watch all three seasons in a weekend on Netflix. We have so many things to distract us from our problems. This is where Lent provides a natural space for self-examination, repentance, and a message of hope and freedom. Timothy Keller says, “we can only defeat a passion with a greater passion.” Participating in the 40 day Lenten journey helps us to practically let go and fast from some things that are destroying our lives and replace them with the only thing that can bring true joy and fulfillment: relationship with Jesus! It’s not just about giving up chocolate; it’s about pursuing Jesus. Helping students practice spiritual disciplines together like fasting, prayer, silence and solitude, journaling, confession, and celebration gives them tools to have that ongoing relationship with Jesus when they aren’t at church. Not to mention the fact that Jesus says in Matthew 6:16, “when you fast.” He expects us to deny ourselves at times in order to focus our hearts on hearing from him. God did not create man to be alone. Yet, we all drift into following Jesus alone at times. Lent is a built in, “let’s do this together!” It is an opportunity to create some shared experiences that develop community in our youth ministries. When everyone is going through a study or giving something up together, it’s unforced accountability. Students can renew each other’s faith because they are on this journey as a unit—preparing for the hope and celebration of Easter together. Winter is almost over. Resurrection is coming. Easter is coming. Revival is coming. Let’s help prepare our students for it! Click here to see Sabrina’s 40-Day Lent Devotion: Jesus On The Cross, Jesus On The Throne. 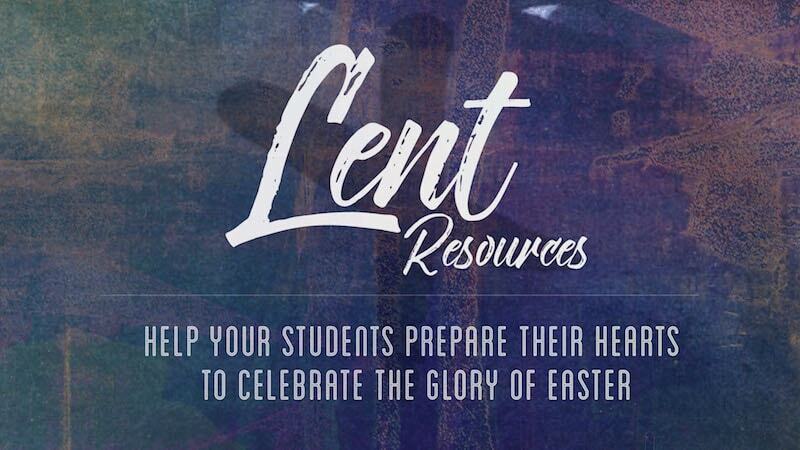 Whether your church annually practices the observance of Lent or this is the first time you and your youth ministry are considering it, check out some great resources to stir-up life-change in the hearts of your students and revival in your ministry: Lent Resources.